Make roads, driveways, and parking lots safer with our parking lot sanding and snow removal services in Palmer & Wasilla, Alaska. 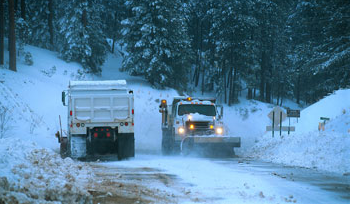 White Knight Services offers complete commercial and residential snow and ice management services. Our company features all of the proper equipment to remove snow and ice quickly and effectively. Contact us for more information about our services. When you choose our snow removal services, you are put on a route. We map out these routes to ensure your place of business will be ready for you and your employees to arrive. With our parking lot sanding and snow removal services, your parking lots will be ice and snow free by the time your doors open for business. Depending on the type of snow, heavy and wet or light and fluffy, we will use different techniques to ensure all snow is removed and to make sure no ice forms. Then we lay down sand, that prevents any left over snow from forming dangerous ice conditions. White Knight Services uses dump trucks and front-end loaders to haul away any amount of snow, from a couple inches to several feet. You will find that our team is very detail oriented, and if our drivers find they need to shovel or clear off areas themselves, they will get out of their truck and take care of it. Call us today at (907) 745-0745 in Palmer, Alaska, to schedule our parking lot snow removal services.